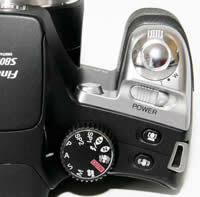 To all intents and purposes, the Fujifilm Finepix S8000fd looks just like a true digital SLR camera. If you lined it up alongside cameras like the Nikon D40x, Canon Digital EOS 400D and Sony A100, you would be hard pushed to spot the odd camera out at a first glance. All is revealed only when you look at the back of the S8000fd when it is turned on, and see the LCD screen showing a live preview of the scene (something which some recent DSLR camera can now do), or if you hold the camera up to your eye and look through the electronic viewfinder. The Fujifilm Finepix S8000fd has similar dimensions and weight to a DSLR, as well as a massive, chunky hand-grip on the right of the camera that makes it possible to hold with just one hand if you so desire. The Fujifilm Finepix S8000fd is also as well built overall as most entry-level DSLRs. Its all-plastic body has a little bit of flex and creak, although it's certainly well above average for the ultra-zoom bracket of compact digital cameras. Fujifilm must be congratulated for almost matching the build quality of a DSLR whilst squeezing in all the other features into the budget. The huge 18x zoom lens obviously makes this one of the most versatile compacts in terms of focal range. The 27-486mm focal length should handle most photographic possibilities, with the exception of ultra wide-angle shots. Thankfully Fujifilm have at last added image stabilisation to their ultra-zoom range, something which was sorely missed on older models like the S6500fd and S9600. Activated by a dedicated button on top of the camera, you can either turn the system on or off. The S8000fd's anti-shake system, called Dual IS Mode, uses a combination of mechanical CCD-shift image stabilisation and the use of high sensitivity settings of up to ISO 6400 to help keep shutter speeds high enough to avoid subject blur in low light conditions. In practice I found that it does make a noticeable difference, as shown in the examples on the Image Quality page. You don't notice that the camera is actually doing anything different when anti-shake is turned on, just that you can use slower shutter speeds than normal and still take sharp photos. Thankfully leaving the anti-shake system on didn't negatively affect the battery-life, with the camera managing over 350 shots using the supplied set of Ni-MH rechargeable batteries. Note that the camera will only automatically adjust the ISO speed when using the Auto or Picture Stabilisation shooting modes - in the more creative modes the ISO speed that you select will always be used, so only the mechanical CCD-shift part of the system is used. On previous Fujifilm ultra-zooms that we've reviewed, like the S6500fd and S9600, the integrated, non-removable lens featured a mechanical zooming ring and a manual focusing ring on the lens barrel, making those cameras feel like a true DSLR. Unfortunately the S8000fd doesn't follow suit, which is a real shame as being able to use a "proper" zooming mechanism that works in the same way as on a 35mm SLR lens is a breath of fresh air, and would have been well-matched to the 18x zoom lens. Instead the S8000fd has a quite responsive zooming lever which surrounds the shutter release button, which is a good example of this type of system. There aren't too many external controls and buttons on the Fujifilm Finepix S8000fd (13 in total), reflecting the fact that this is a camera in the mould of an entry-level DSLR. Most of them are thankfully clearly labeled and common to most cameras. There's a traditional dial on the top of the camera that lets you select the different exposure modes; Auto, Program, Shutter Priority, Aperture Priority and Manual. This dial is a typical feature of SLR cameras, and enables you to quickly change between the various modes. The various Scene, Picture Stabilisation, Natural Light and the Movie modes are also accessed via this dial. As with most other Fujfilm digital cameras, the Fujifilm Finepix S8000fd has a Menu button on the rear of the camera which, as you would expect, gives you access to the software menu system. The main menu system on the Fujifilm Finepix S8000fd is straight-forward to use and is accessed by pressing the Menu/OK button in the middle of the navigation pad. There is a single Shooting menu with 10 options. A number of the camera's main settings, such as white balance, exposure mode and AF mode, are located in this menu. At the bottom is the Setup option - select this to access 4 more tabbed pages (18 options in total) which contain options that you will probably set once and then forget about. Due to the large LCD screen, the various options and icons are perfectly easy to read. There is also a small silver button with an F on it, which opens what Fujifilm call the Photo Mode menu. This allows you to control the file quality setting, ISO speed and colour settings (B&W, Chrome or Standard). I'm not really sure why these 3 settings alone should fall under the heading of Photo Mode, and things like white balance and sharpening are just part of the standard menu. And I'm undecided about whether it is a good idea or not. The F button does give quick access to certain features, but you do have to memorise what another button does. If you have never used a digital camera before, or you're upgrading from a more basic model, reading the comprehensive and fairly easy-to-follow manual before you start is a good idea. Thankfully Fujifilm have bucked the recent trend of not providing hard-copy manuals by supplying it in printed format. The S8000fd features an xD/SD compatible memory card slot, allowing the use of either xD Picture Card, SD or SDHC cards. As SD cards are more popular and cheaper than xD, this is a good move by Fujifilm. There's also 58MB of internal memory, more generous than many competitors. 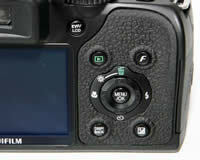 Fujifilm have added a dedicated Face Detection button to the top of the Finepix S8000fd. This system works in all of the shooting modes, making it accessible to beginners and more experienced photographers alike, and optimises focus, white balance and exposure for up to ten faces in a single frame. The S8000fd features Intelligent Face Detection, a new improved system that can now detect and fix red-eye before the image is recorded. Also movement tracking keeps the camera 'locked on' to its subjects until they move out of the picture. It's really best for posed group shots where your subject(s) is standing still at a moderate distance, as the system is fooled if the subject is too far away, is moving too quickly or has their head turned sideways. The manual amusingly says that it will also fail if the subject is standing on their head! Fujifilm's new innovation is hardware-based and therefore a lot faster than other face detection systems that I have used, although it shares similar limitations to its competitors. Another greatly improved feature on the Fujifilm Finepix S8000fd is the EVF display, which is now much higher resolution (230,000 pixels) than previous cameras, and also offers a refresh rate of 60 frames per second, ensuring that the screen in front of you appears smooth and natural in the viewfinder. As this camera has largely been designed to replicate a DSLR, it means that you will invariably compose your images by holding the camera up to your eye. I still found that the EVF doesn't quite keep up with the eye quite as quickly or precisely as an optical viewfinder, but it didn't give me eye-strain after extended periods of use and was generally much more pleasant to use. Also on the plus side, there is a lot more visual feedback via the EVF than on most optical viewfinders, it offers 97% scene coverage and dioptre adjustment, and you can also playback your images on it if you so wish! I still much prefer a traditional, good quality optical viewfinder though, and this would be one of the main reasons for opting for a true DSLR instead of the Fujifilm Finepix S8000fd. The S8000fd's 2.5 inch LCD monitor offers the same specification of 230,000 pixels resolution 97% scene coverage and 60fps frame rate. The Fujifilm Finepix S8000fd offers a range of advanced exposure modes, including shutter-priority, aperture-priority and manual, perfect for the photographer who wants to take full control. The S8000fd also has a few interesting features up its sleeve that are designed to take better photos in low-light situations. The Picture Stabilisation mode forces the camera to select a fast shutter speed in order to freeze subject movement more effectively, whilst also setting a fast ISO speed and firing the flash (the Natural Light scene mode doesn't fire the flash). It's an effective automatic way of taking photos of children indoors, for example. Intelligent Flash is a little more exciting. This feature is actually a new scene mode called Natural Light and Flash (obviously the marketing department didn't talk to the engineers about the naming convention). When selected, the camera instantly takes 2 photos, one with flash, one without, giving you the option of which one to choose later (both are saved by the camera). The start-up time from turning the Fujifilm Finepix S8000fd on to being ready to take a photo is OK at around 2.5 seconds, whilst zooming from the widest focal length to the longest takes around 4 seconds, understandable given the huge focal length on offer. Focusing is very quick in good light and the camera achieves focus most of the time indoors or in low-light situations, helped by a powerful focus-assist lamp. The visibility, resolution and refresh rate of both the 2.7 inch LCD screen and the electronic viewfinder (EVF) are good. It takes about 2 seconds to store a JPEG image, allowing you to keep shooting as they are being recorded onto the memory card - there is no LCD blackout between each image. In the Top-3 continuous shooting mode the camera takes 1.3 frames per second at the highest image quality, limited to only 3 frames, which is below average for this class of camera. There is also a Long Period mode that allows you to take 0.5 frames per second for an unlimited number of images, plus a High speed mode (7fps at 4 megapixels) and Ultra High Speed (15fps at 2 megapixels). 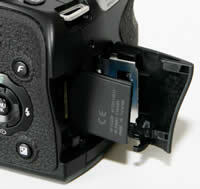 All in all the Fujifilm Finepix S8000fd is about average in terms of operational speed. Once you have captured a photo, the Fujifilm Finepix S8000fd has a good range of options when it comes to playing, reviewing and managing your images. You can scroll through the images that you have taken, view thumbnails (up to 100 onscreen at the same time! ), zoom in and out, sort images by date, view slideshows with lots of different settings, delete, protect, trim and rotate an image. You can also add a sound clip to an image and set the print order. The Display button toggles between various views, whilst holding down the Exposure Compensation button shows detailed settings information about each picture, such as the ISO rating and aperture/shutter speed, and a brightness-based histogram. 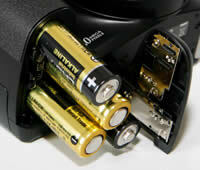 In summary the Fujifilm Finepix S8000fd offers a DSLR-like design with all the advantages of a compact digicam. The new 18x zoom is at last accompanied by a mechanical image stabilisation system, and the electronic viewfinder is much improved. PhotographyBLOG is a member of the DIWA organisation. Our test results for the Fujifilm Finepix S8000fd have been submitted to DIWA for comparison with test results for different samples of the same camera model supplied by other DIWA member sites.